With the objective to enhance the current catering quality standards of their outport catering stations, Hong Kong Dragon Airlines Limited (Dragonair) introduced their newly developed Caterer Performance Management Program (CPMP) in 2012. This program serves as a very comprehensive system to measure and recognize caterers’ performance from all perspectives including Quality, Safety & Customer Satisfaction for a period of one year. Part of the rating system included a survey conducted in January 2013. Direct ratings were given by managers in catering departments, KA local airport managers and the Cabin Crew. The results were tabulated with MacroAsia Catering Services (MACS) in Manila successfully clinching the Silver Award, the second highest award, recognizing the company as a top performing caterer amongst the 24 catering outstations where Dragonair flies to/from worldwide. 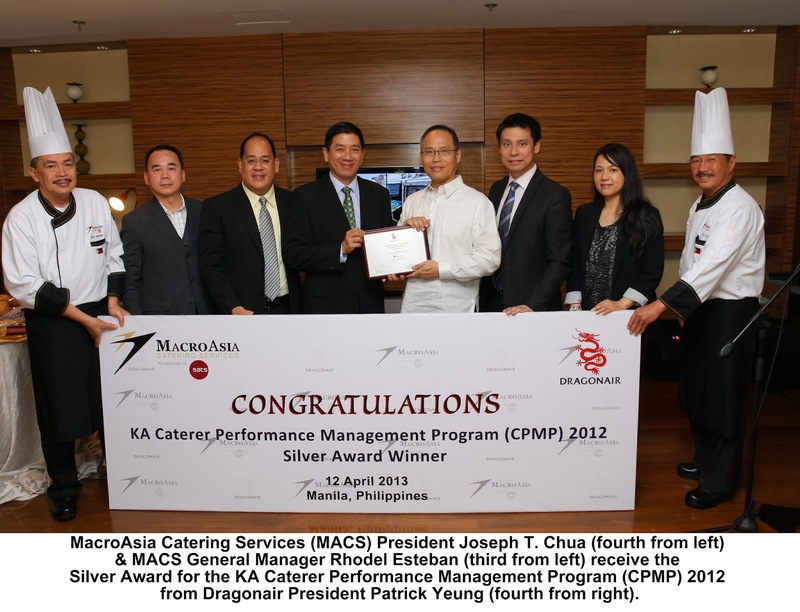 The outcome of the CPMP survey indicated that MACS achieved outstanding ratings in all perspectives of the 7 measuring criteria and executed reliable, consistent and high quality catering services to Dragonair. The awarding ceremony was held at The Den, Marriott Hotel last 12 April 2013. The ceremony was attended by Mr. Patrick Yeung, Dragonair’s Chief Executive Officer. Mr. Andy Wong, General Manager for Inflight Services. Ms. Kim Chong, Manager for Catering Services and Mr. Edmond Lo, Manager for Performance, Quality Assurance & Special Projects. The award was received by Mr. Joseph Chua, MACS President and Mr. Rhodel Esteban, MACS General Manager. The handing of the award was witnessed by the local executives of both Dragonair and Cathay Pacific including Mr. Martin Xu, Country Manager. Mr. Ray Fung, Dragonair Reprsentative in Manila and Mr. Eddie Monreal, Airport Station Manager. Also present are the executives from MacroAsia Corporation and the MACS Management Team and staff. Dragonair (KA) operates five (5) weekly flights from Manila to Hong Kong.